Two Days One Night (2014) a film about Sandra, (played by Marion Cotillard) a young Belgian mother, who discovers that her workmates have opted for a significant pay bonus, in exchange for her dismissal. She has only one weekend to convince her colleagues to give up their bonuses so that she can keep her job. Is this something that could happen in real life? The Directors/Writers Jean-Pierre and Luc Dardenne said the idea came from reading news stories about similar situations where workers solidarity was challenged. In the film, the workplace becomes a battleground, these are struggling workers with families and not CEO’s or fat cats. Sandra finds and creates solidarity, uncovering people’s true nature as well as her own. Cotillard talks about the difficulty of portraying her character: basically she has the same thing to say ten times. She had to find the evolution, the slight details that created the drive and motivation to keep Sandra moving even though she is telling people the same thing in her endeavours to persuade them to vote for her to keep her job and give up their bonuses. But because it’s almost but not the same thing, the tiniest changes in each scene meant Sandra’s confidence would go up and down and everything she could build up from those little differences would help her to identify how to angle each pitch she made. Each meeting was filmed in real time, this allowed each of the characters to be fully present and accentuated the tension and the movements within that tension. The shots were addictive which draw the audience in. It’s like watching a live match, will they score, won’t they score … There is a strong focus on the audience, and the importance of creating a scene to take them on a journey. Everything is about taking them somewhere, surprising them, making them feel super special. 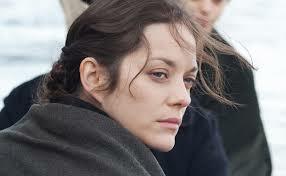 Interestingly Cotillard said for a lot of directors its not about the audience! The brothers spend a lot of time in the rehearsal process. They talk about rehearsal allowing the actors to be truly present and it’s only when they are truly present that the scene can exist and the tensions and rhythms arise. They say rehearsals allow the exploration of tracks, which then don’t need to be explored again. They say you only get the picture right once, there’s only one shot possible. There’s room for manoeuvre because they’re on the right track. They acknowledge that while every actor is different, the work of creating a presence is the same, making them as present as possible allowing the actors to have more of a presence. Every role was equally important making the scenes possible because everyone had a leading role. The art of persuasion, negotiation and influence is built on the same powers of observation, the ability to notice the minutest change, to be fully present in the moment and to react in real-time is of utmost importance, because as the brothers say: “there’s only one shot possible” . Previous PostOvercoming Significant ChallengesNext PostWhere Will You Be in Five Years?